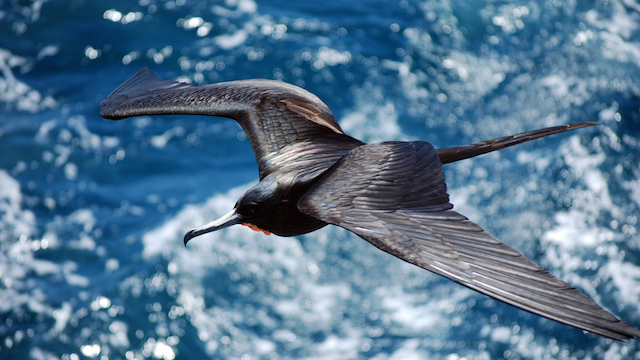 Frigatebirds spend weeks or even months at a time cruising above open ocean, spearing fish from the surface. Their voyages take them far from any place to rest, and the birds can’t swim, which has made their feats of endurance a biological puzzle. Ornithologist Henri Weimerskirch of the French National Centre for Scientific Research (CNRS) and colleagues fixed GPS trackers, accelerometers, and heart rate monitors to frigatebirds to track their travels and energy expenditure. In a study published this summer (July 1) in Science, the researchers reported that the birds spent about as little energy soaring hundreds of miles every day as they would sitting at rest. Their trick is to ride thermal currents upward for thousands of feet and then glide down while the enormous birds prowl for prey, the authors found. An instinctive sense for atmospheric patterns appears to guide the birds’ flight pattern, as they reliably skirt equatorial doldrums, where updrafts are few and far between. Humans began using tools to solve problems thousands of years ago, but our primate relatives are not too far behind. Capuchin monkeys are known to deploy rocks and sticks for various purposes, but according to a recent geological find, they’ve been using rocks as hammers for at least 700 years. “This is the first time that non-Great Ape tool use has been documented in the archaeological record,” Robert Shumaker, an evolutionary biologist not associated with the study, told The Christian Science Monitor. Researchers at a national park in Brazil excavated below groves of cashew trees and discovered stone tools buried in the ground that resembled those used by modern monkeys. Brazilian bearded capuchins (Sapajus libidinosus) that live in this area have a hammer-and-anvil technique for smashing open the thick, toxic shell of a cashew nut, setting the nut on a flat stone and swinging at it with a smaller one, the researchers noted in their paper, published this summer (July 11) in Current Biology (see video, below). The tools become stained with dark resin from the nuts, a telltale sign for archaeologists. 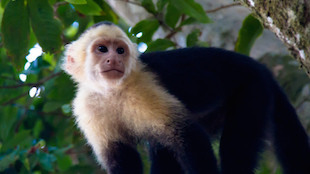 Capuchins developed tool use independently from their ape and chimpanzee cousins, so their case might expand our understanding of how primates discover and spread tool use, the authors write. Azteca ants (Azteca sericeasur) live on coffee plantations in the south of Mexico, where they’re at the center of a complex ecological web. Kate Mathis of the University of Arizona and colleagues have been untangling this web for the last six years, starting with an investigation into the phorid flies (Pseudacteon) that parasitize these ants. 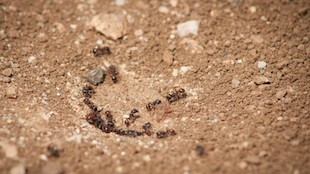 The team discovered that the flies locate ants by eavesdropping on their communication system, following the scent of an alarm pheromone and then laying eggs inside the ants. But phorid flies are not the only ones trying to find the ants. During experiments in which Mathis released alarm pheromones to document the behavior of the flies, tiny beetles (Myrmedonota xipe) kept crowding in on the experiment and causing a nuisance, the scientists found. Upon closer investigation, the team realized that the beetles prey upon the parasitized and debilitated ants. In a container full of both healthy and parasitized ants, the researchers watched the beetles go straight for the weaker targets, following the alarm pheromone. “When the beetles tried to attack healthy ants, they were swiftly rebuffed. But when they attacked parasitized ants, the ant essentially stood still as the beetle ate it alive,” Mathias wrote at The Conversation. The team’s results were published in Proceedings of the Royal Society B last month (August 10). Bats navigate the nighttime landscape with the help of echolocation, letting off chirps and listening when sound waves bounce off obstacles. But when it comes to finding the nectar-rich flowers that some bats feed on, they don’t just follow the noise, they follow their nose, too, researchers from the University of Ulm, Germany, reported in Royal Society Open Science last month (August 10). Bats can detect a nearby flower with echolocation, but following the scent of a flower can allow them to find food that is much farther away. The researchers presented lesser long-nosed bats (Leptonycteris yerbabuenae) with a choice between an artificial flower that they could both smell and echolocate, or one that they could either only smell or only echolocate. 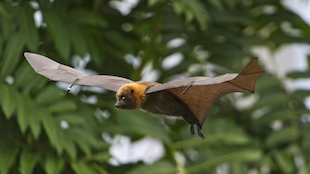 The bats usually chose the combined stimuli, indicating they incorporate both smell and echolocation when they’re searching for a meal. “Some bat-pollinated plant species evolved structures reflecting conspicuous echoes that attract bats to the food source,” the authors wrote in their paper, noting that the findings could help explain why bat-pollinated plants also frequently produce strong scents. Interestingly, when the bats had a choice between an isolated auditory cue (a flower-shaped object) and an olfactory cue (a puff of flower scent), the animals showed no preference for one or the other, possibly meaning bats rely on their noses just as much as their large ears, the researchers wrote. Cargo ships are known to affect marine life in a number of ways. 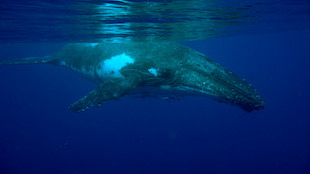 Researchers at Syracuse University in New York and their colleagues recently added to the list, reporting evidence that underwater noise pollution from ships disturbs the feeding habits of humpback whales (Megaptera novaeangliae). The team’s findings were published in Biology Letters last month (August 9). Whales are sensitive listeners, using sound to communicate and to monitor their environment, so they’re vulnerable to disruptive, foreign noises, the researchers noted. As Hans Thewissen of Northeast Ohio Medical University put it: “If you sit at a black-tie dinner, and someone blows a tuba in your ear, you might get up and leave. Same with the whales,” he told the Associated Press (AP). The researchers attached microphones and satellite trackers to whales and recorded the animals’ behaviors as ships passed by overhead. They found the animals dived more slowly in the presence of ships—reducing the amount of time they could spend hunting near the bottom—and performed fewer side rolls—a maneuver they use to catch fish.